On a recent visit to Alaska, I "caught" this picture of a Chinook. In a previous post, we explained how U.S. Army helicopters are named for Indian Tribes. 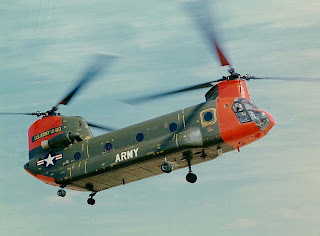 The CH-47, "Chinook" is a hard working member of the U.S. Army helicopter inventory. The Chinook" Salmon is the largest member of the salmon family. Salmon return from the Pacific Ocean to Alaskan streams to spawn and Salmon fishing is an Alaskan industry. The convention and arts center in Anchorage recently had a contest and display of art objects made from salmon. 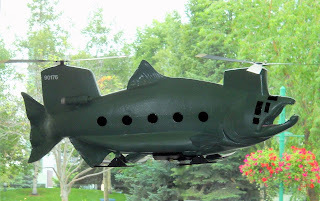 Titled "Chinook at 14,000 feet", the award winner shown at the start of this article was judged worthy of report in this blog by the Cold War Air Museum associate passing by. This is one of the cutest, funniest, light hearted story I have read thus far! Brovado, keep 'em coming!